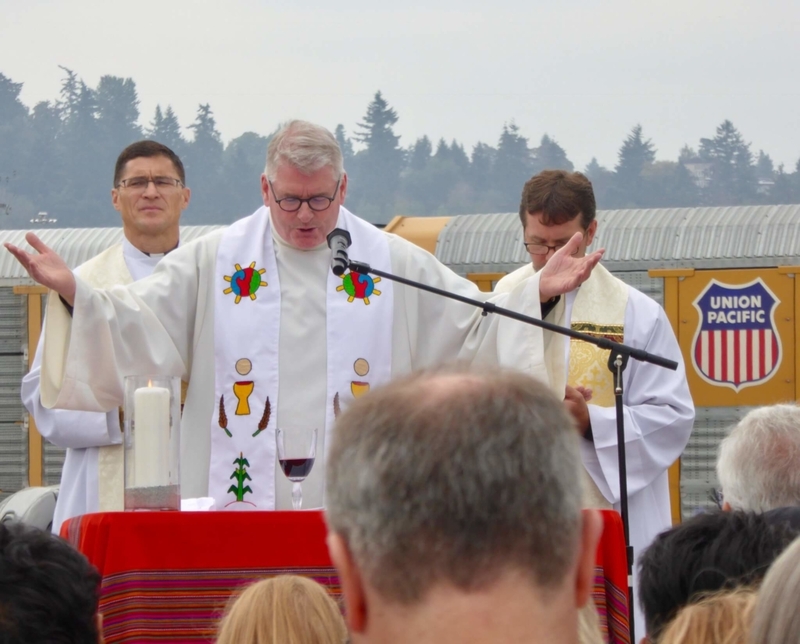 Two Jesuit parishes in the Pacific Northwest, St. Joseph Seattle and St. Leo Tacoma, joined together to coordinate a pilgrimage and Mass at the GEO-run Northwest Immigrant Detention Center on Saturday, August 25, 2018. More than 500 faith-filled pilgrims prayed and sang for 1.6 miles from St. Leo to the Center where over 1,500 detainees are imprisoned while waiting for immigration hearings or deportation. St. Joseph Parish members participate in the pilgrimage. (L-R) Fr. Scott Santarosa, S.J., Fr. John Whitney, S.J., and Fr. Matt Holland, S.J. celebrate Mass outside of the Northwest Immigrant Detention Center on Saturday, August 25, 2018. During the event, signatures were collected on a petition for the reform of immigration policies in the United States, which will be delivered to local congressional offices. The event renewed energy for continuing work on behalf of immigrants and refugees. Mass and pilgrimage participants share a meal after the event. However, even more inspiring were the connections made with the help of the Ignatian Solidarity Network. Over 18 Jesuit parishes and works across the U.S. joined in the group of pilgrims in prayer or with their own activities. In the Jesuits West province that included St. Aloysius in Spokane, St. Ignatius in Portland, St. Ignatius in Sacramento and San Francisco, St. Agnes in San Francisco, Dolores Mission in Los Angeles, St. Francis Xavier in Missoula, the Intercommunity Peace and Justice Center in Seattle, the Ignatian Spirituality Center in Seattle, and the Kino Border Initiative in Nogales, Arizona and Sonora, Mexico. 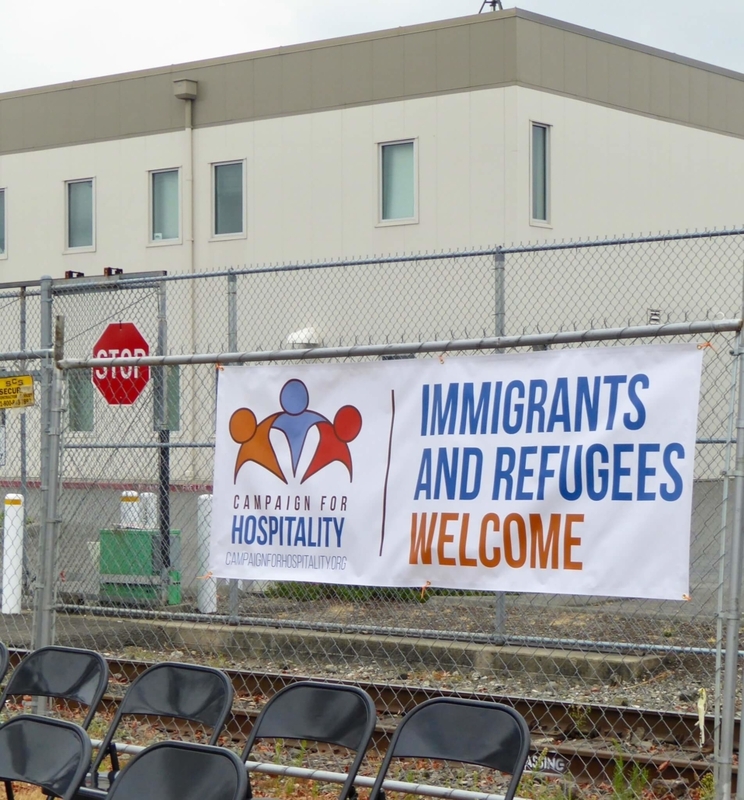 A Campaign for Hospitality banner outside the Northwest Immigrant Detention Center. 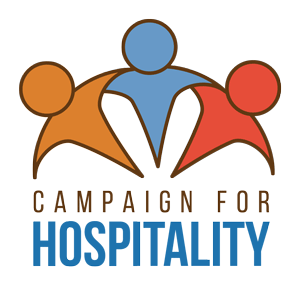 St. Joseph Parish is a Campaign for Hospitality member institution. Parishes in other parts of the country include St. Francis Xavier in St. Louis, Bellarmine Chapel at Xavier University in Cincinnati, Church of the Gesu in University Heights, OH, St. Francis Xavier and St. Ignatius in New York City, St. Ignatius in Chestnut Hill, MA, Holy Trinity in Washington D.C., St. Ignatius in Baltimore, and St. Thomas More in Atlanta. Five of these parishes will be leading their own pilgrimage and Mass or prayer service at detention centers in their area: St. Ignatius in Chestnut Hill, MA, Holy Trinity in Washington D.C. and St. Ignatius in Baltimore, and St. Francis Xavier and St. Ignatius in New York City. All the Jesuit parishes and works that have joined in this endeavor have expressed interest in continuing collaborations related to immigration reform. Knowing that there is more important work to be done, an ongoing discussion will continue through the Jesuit Parish Collaboration Framework. 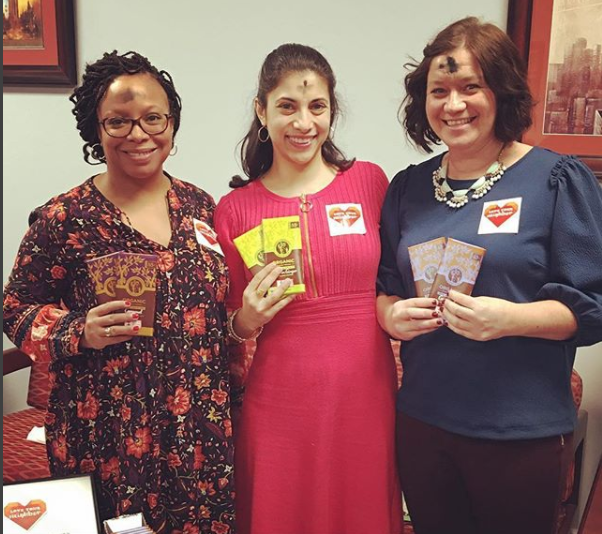 The Ignatian Solidarity Network designed the initiative to deepen Jesuit parish connection to the Ignatian network by engaging in discernment, action, and advocacy as a parish network. Vince served the U.S. Department of Health and Human Services for 32 years, retiring as an Associate Regional Administrator in 2007. 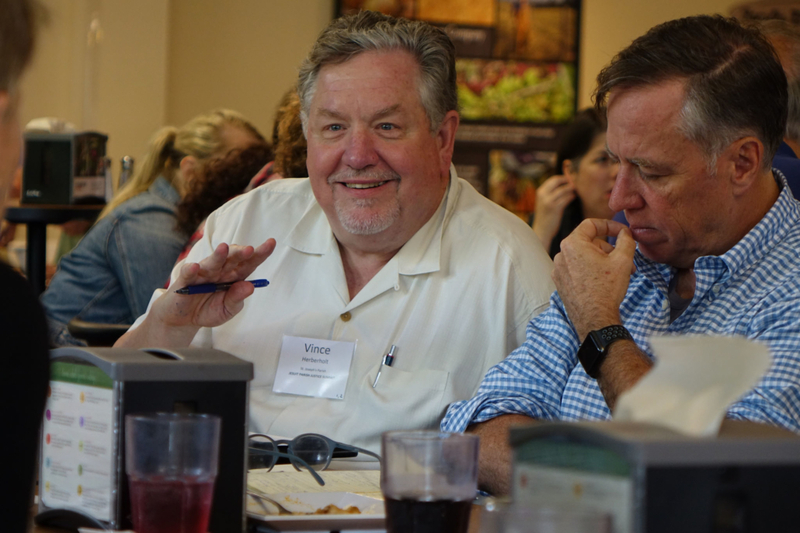 After retiring, Vince completed a master’s degree in pastoral studies at Seattle University. He served on the board of JustFaith Ministries for 8 years and currently serves on the board of the Ignatian Spirituality Center, where he helps to coordinate the Men’s Spirituality program. Vince is a member of St. Joseph Parish, the Jesuit Parish in Seattle. He has been married to Cathy Murray for 41 years. They have 2 adult sons, Bernard and Conrad. 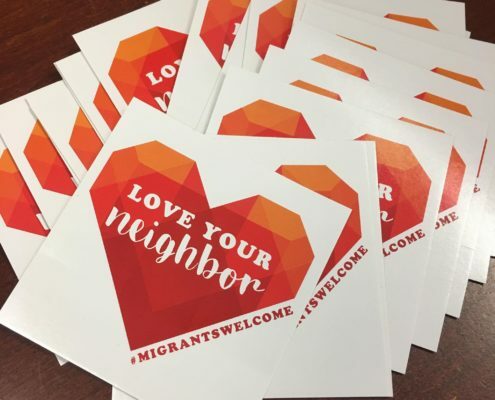 Throughout the upcoming year, Jesuit parishes across the U.S. are participating in a host of actions in support of immigrants and refugees in the U.S. 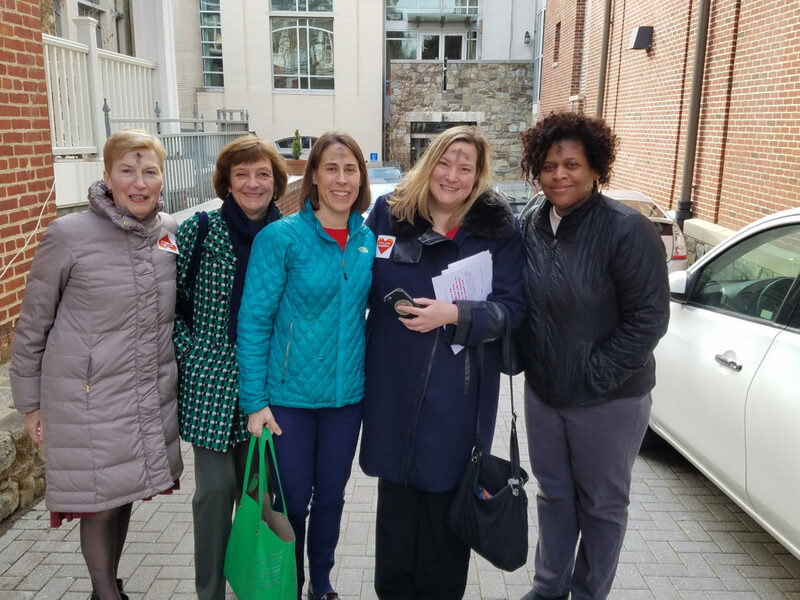 These efforts were, in part, an outcome of the Ignatian Solidarity Network’s 2018 Jesuit Parish Justice Summit, and of continued networking between Jesuit parishes following the Summit. Actions center around immigration detention center vigils and pilgrimages, an idea initially proposed at the Summit by Vince Herberholt, a parishioner at St. Joseph Parish in Seattle. 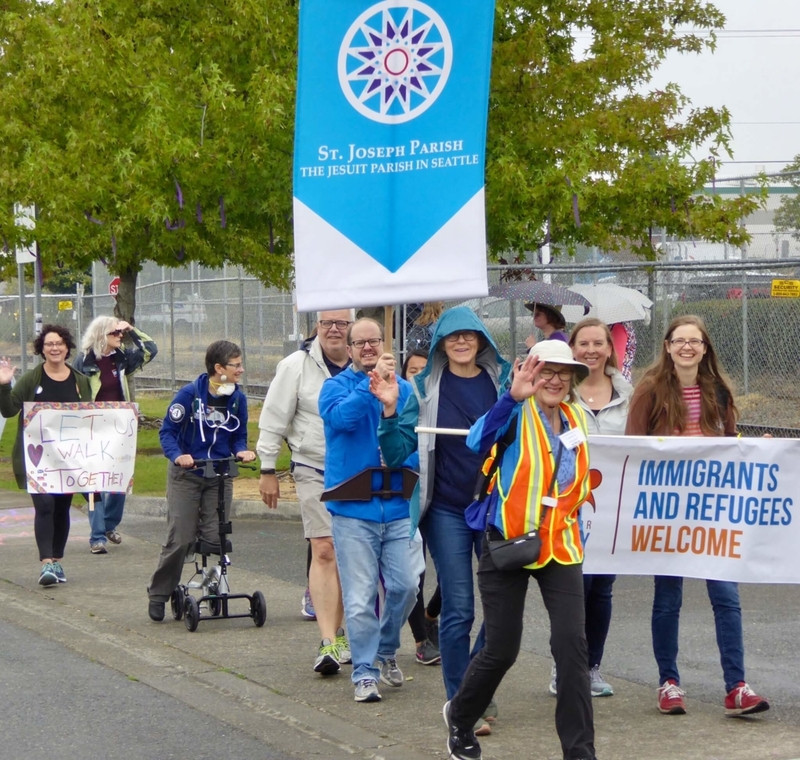 St. Joseph will gather with parishioners from St. Leo, a Jesuit parish in Tacoma, Washington, on August 25 for a Mass and pilgrimage to Northwest Detention Center in Washington, where 1,600 individuals are presently incarcerated. St. Joseph Parish has also drafted an immigration statement for sign-on by parishioners and has begun hosting immigration forums, including featured speaker U.S. Representative Pramila Jayapal (D-WA) discussing detention center legislation. The parish is working to increase advocacy efforts around this issue. 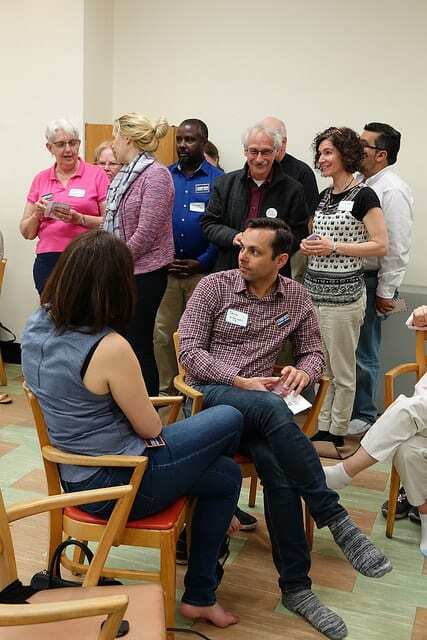 Vince Herberholt, a parishioner at St. Joseph, a Jesuit parish in Seattle, speaks with fellow attendees at the Ignatian Solidarity Network’s 2018 Jesuit Parish Justice Summit. 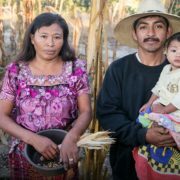 As a part of a coordinated effort amongst Jesuit parishes following the Summit, a number of additional faith communities are planning a variety of events—in the form of a vigil, Mass, pilgrimage, parish education effort, or prayerful solidarity with other parish efforts across the country—in support of those held in immigration detention. St. Ignatius San Francisco, St. Ignatius Sacramento, and Most Holy Trinity in San Jose are planning a pilgrimage and Mass at a detention center in their area. St. Ignatius in Chestnut Hill, Massachusetts is planning a pilgrimage and Mass at Suffolk County Jail and Detention Center near Boston. Later this fall, Holy Trinity in Washington, D.C. and St. Ignatius in Baltimore, MD are planning a pilgrimage and Mass at the Broward County Jail in Maryland. 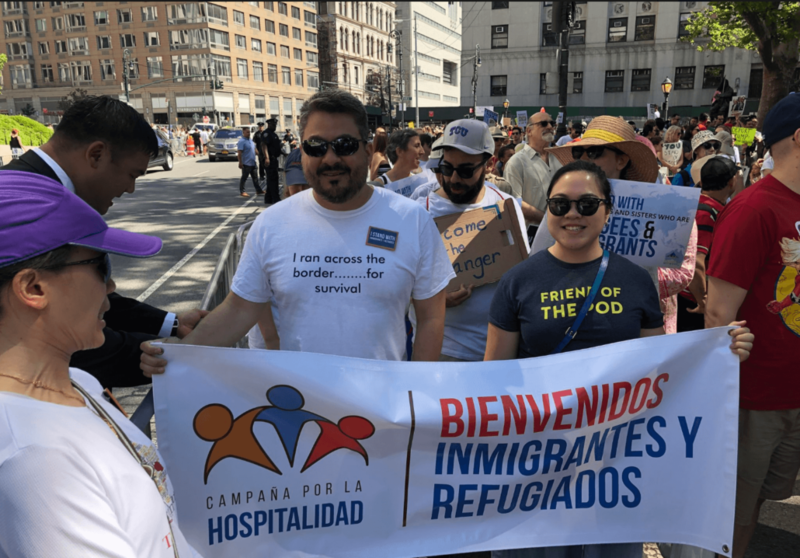 Joined by the Undocumented Student Center at St. Peter’s University in Jersey City, NJ and local Sisters of Charity, St. Francis Xavier and St. Ignatius in New York, NY are also planning a pilgrimage and Mass at the Elizabeth, New Jersey Detention Center. St. Francis Xavier in Missoula, MT is participating in prayer vigils at the immigration detention center in Missoula, as well as providing information and training sessions to parishioners and facilitating advocacy efforts directed towards their members of Congress. Standing in solidarity with undocumented newcomers and protesting the inhumane policies that split up families, St. Ignatius in Portland, OR joined an ecumenical gathering protesting at the Federal Detention Center at Sheridan, OR. 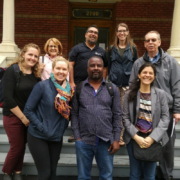 Other parishes are engaging the JustFaith Exploring Migration group model, including St. Ignatius in Sacramento, Bellarmine Chapel at Xavier University in Cincinnati, OH, and St. Aloysius in Spokane, WA. 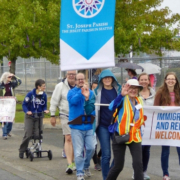 St. Ignatius in Portland, OR joined an ecumenical gathering protesting at the Federal Detention Center at Sheridan, OR—standing in solidarity with undocumented newcomers and protesting the inhumane policies that split up families. Parishes including St. Ignatius Portland, Bellarmine Chapel in Cincinnati, OH, and Church of the Gesu in University Heights, OH, are considering additional actions later in the year. Chris Weekly, S.J. (Jesuits West), Caroline Earnest and Tyler Wagner from St. Ignatius in Portland, OR, and Dan Corrou, S.J. and Kevin Tuerff from St. Francis Xavier in New York City discuss collaboration at the Ignatian Solidarity Network’s 2018 Jesuit Parish Justice Summit. For more information about these events or for media inquiries, please contact Ignatian Solidarity Network communications director, Kelly Swan. 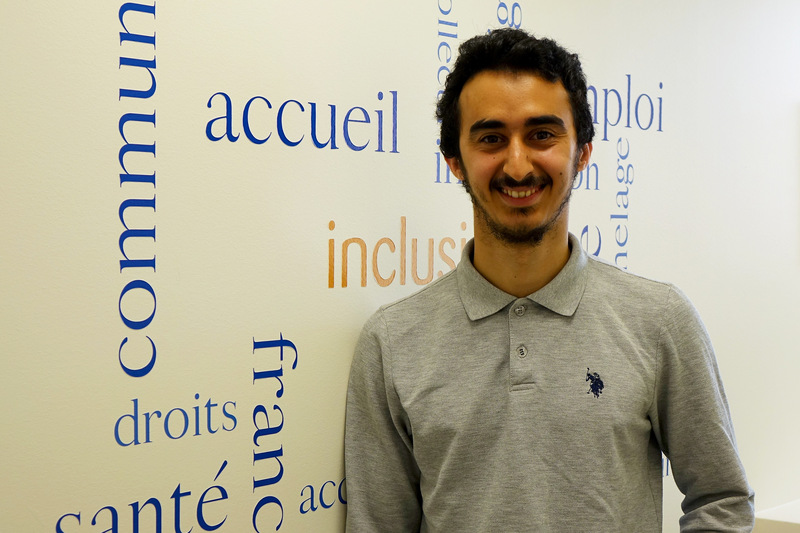 Hicham Khanafer is project manager for Le Centre social d’aide aux Immigrants (CSAI), a refugee resettlement agency in Montreal, Canada. His sentiment was a common thread throughout the Canadian Migration Immersion Experience, which gathered 10 partners in Jesuit mission from May 22-25. 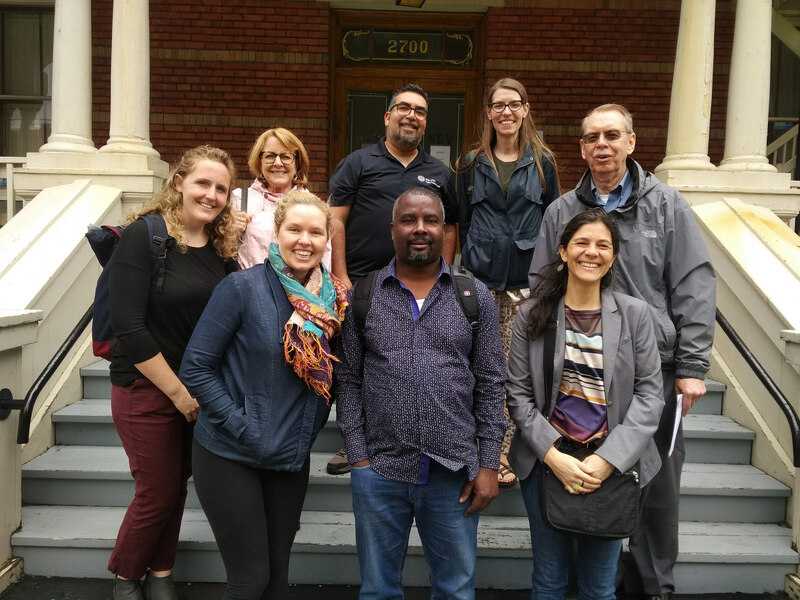 The immersion—co-organized by Norbert Piche of Jesuit Refugee Service/Canada and the Ignatian Solidarity Network—examined the Canadian approach to welcoming refugee claimants—a term equivalent in the U.S. to refugee or asylum seeker. 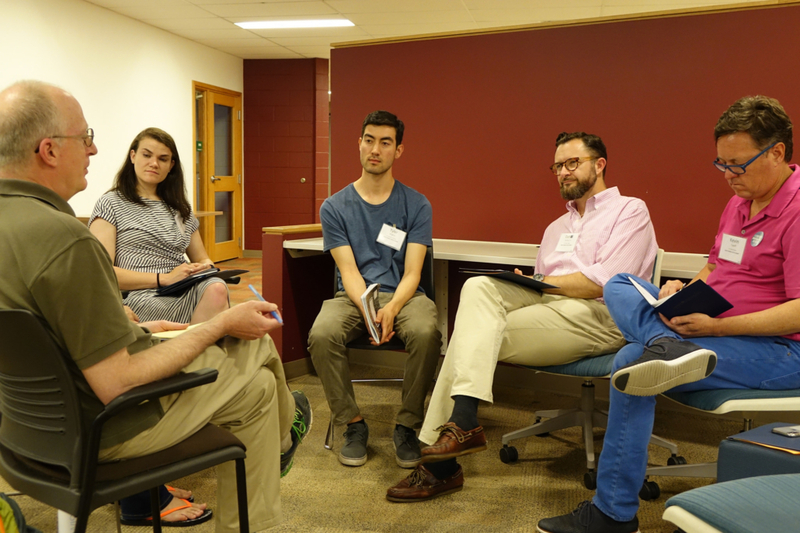 Participants brought a broad understanding of refugee issues, representing organizations including Jesuit Refugee Service in the U.S., Canada, and Mexico; Migration and Refugee Services; Creighton University; and the Jesuits of Canada and the United States. Outside Le Pont, a residence and place of refuge in Montreal for up to 30 refugee claimants on any given day. The experience covered policies both promising and problematic. Canada’s private sponsorship refugee program allows any group of five or more people or an organization to sponsor a refugee to resettle in their local community. 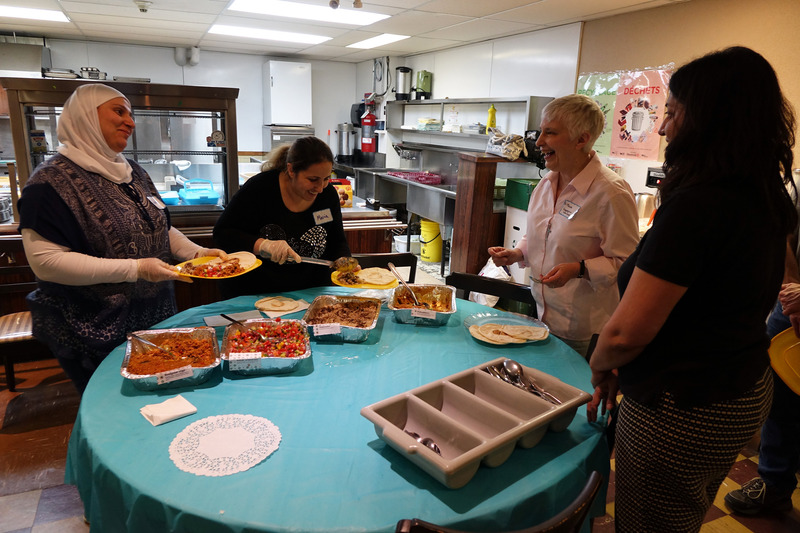 As sponsors, they assist with housing, clothing, food, and social and emotional support for the length of the resettlement process—although the bonds forged last much longer. 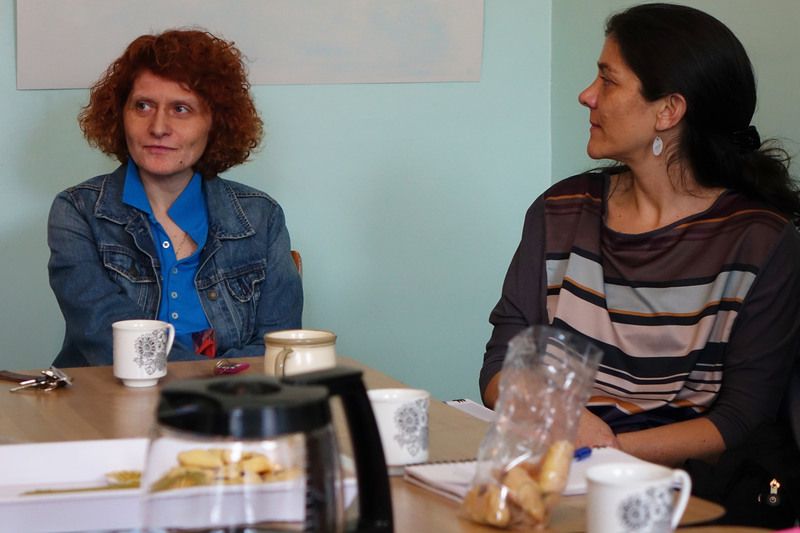 The group had the chance to meet with Larissa*, a refugee from Syria, and Michael, who through collaboration with JRS/Canada was able to sponsor her resettlement. Their mutual respect for one another radiated throughout the conversation as they talked about Larissa’s first months in Canada, diving into learning French and securing a new job. Michael, who described his local community as very conservative, was inspired to take part in the private sponsorship process after watching the news and then hearing a presentation on private sponsorship organized by his local diocese. He noted that when his parish first heard the presentation “nobody was interested, period. Now I think they would think twice, having seen Larissa come to Mass, having had the opportunity to have dinner with Larissa.” It is in these specific moments, when combined, that the tides are turning in Canada. Another notable difference between Canada and the United States is its approach to refugee claimants or asylum seekers. In the last year, Canada has seen a spike in claimants crossing the U.S. – Canada border at an unofficial border crossing called Roxham Road, two hours south of Montreal and just north of Champlain in upstate New York. The Roxham Road unofficial U.S.-Canada border entry point. The reasons for refugee claimants fleeing the United States for Canada was a topic of interest in itself—some reasons include the cancellation of TPS for Haitians and Salvadorans and an increasingly dangerous political climate—but the reason for that specific location for crossing is tied to Canada and the United State’s Third Safe Country Agreement (TSCA). Through this agreement, if an asylum seeker enters Canada from the United States through an official border crossing, Canada has the right to turn them away. The United States is now seeking to establish this agreement with Mexico, allowing it to turn away all asylum seekers who present themselves at official border points between Mexico and the United States. 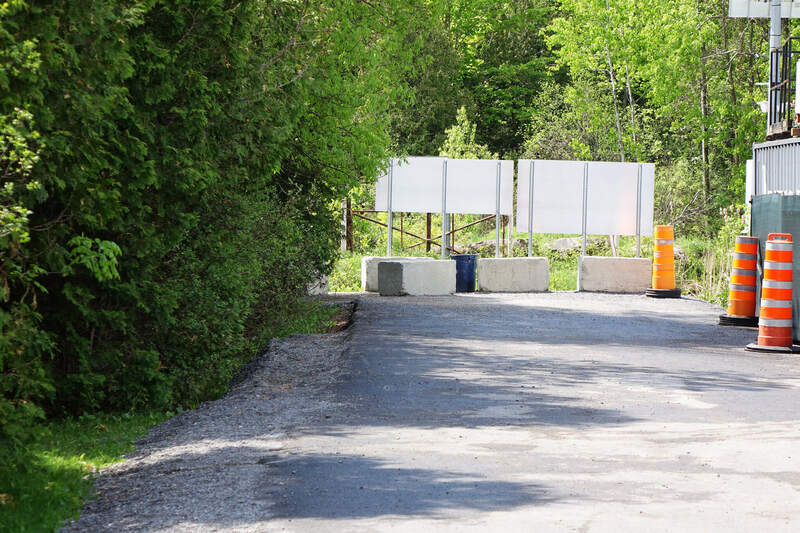 TSCA does not apply to individuals who cross at unofficial entry points like Roxham Road, which until a year ago was simply a break in a paved road between two small New York and Quebec communities. 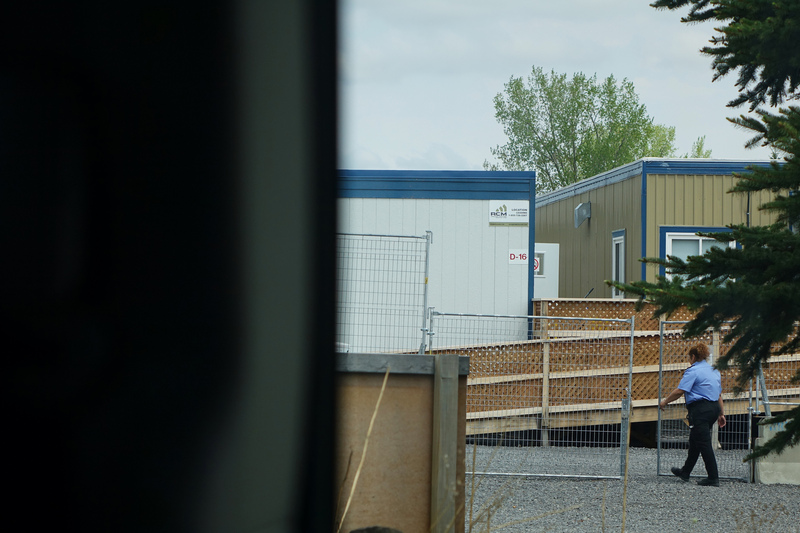 The entry point is now guarded 24/7 by Canadian Mounted Police and marked by a fence and a security processing facility. Once claimants enter Canada through this crossing, their identities are verified and they are sent to a temporary housing unit a few miles away while their initial screening takes place. Temporary housing units for recent refugee claimants, who spend just days here before moving on to housing through agencies like the YMCA. Refugee claimants in Canada are guaranteed housing for 30 days through agencies like the YMCA, as well as healthcare and the right to work for the duration their claim is being processed. Contrast this to the process in the United States, where asylum seekers receive no such rights, and on average, are kept in limbo for an average of 1,000 days while their case is processed. In many cases, asylum seekers—including children and families—have been held in immigration detention centers for some or all of this time. (American Immigration Council). Alessandra Santopadre and Andrea Villaseñor at Le Pont. Immersion participants during a refugee simulation developed by JRS/Canada. 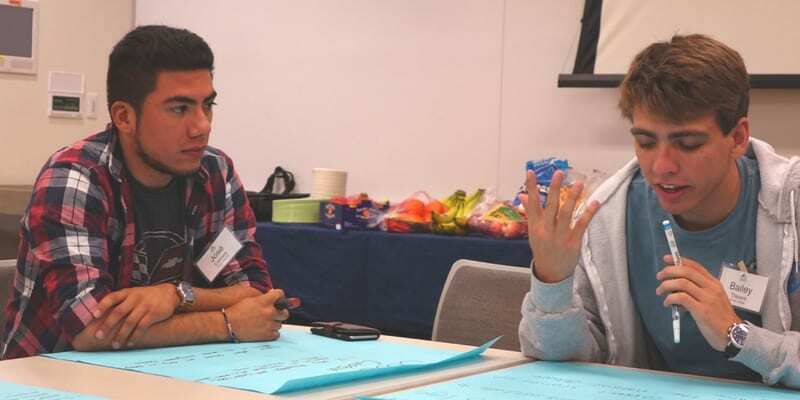 In small groups, participants were assigned identities of individual refugees and were lead through decisions amongst the group on what should be gathered when fleeing home, who would be able to apply for asylum in another country, and who would be forced to stay in refugee camps or live as urban refugees. During their time at Le Pont, residents receive support in finding work, an apartment, and connecting with the best tools and references to settle into their life in Quebec. But in the moments not filled with paperwork, it mainly serves as a place to “exhale” in the midst of chaos. It is clear that not everyone in Canada supports welcoming refugees, evidenced by the anti-immigration protests happening at the border while the immersion was taking place. But this has not stopped individuals and organizations from continually inviting long-time and newly resettled community members into reflection, dialogue, and—most importantly—encounter. During one of the final evenings of the immersion, the group gathered for a dinner with 50+ parishioners from parishes around the diocese that have participated in the private sponsorship program. The dinner opened with a welcome from two women who had prepared an exquisite meal of traditional Syrian foods. These women are members of the newly formed Les Filles Fattoush catering company, which is comprised of 20 women who are fantastic cooks and are newly resettled from Syria. The company’s goal is not only to provide good food but to encounter people in their community through the sharing of food and culture. Dinner served by Les Filles Fattoush. While the immersion highlighted policy ideas and approaches for the United States consider, in the end, it illuminated the call to encounter. In working with government-assisted refugees, Khanafer noted that one of the biggest challenges in the resettlement process is an intense feeling of isolation. “You don’t necessarily know anyone in those first days,” he explained. It is through encounters and continued dialogue that a new country can begin to feel like a new home. In ending his conversation with the group, Khanafer relayed one of those specific moments when he felt CSAI had been successful. Hicham Khanafer, project manager for Le Centre social d’aide aux Immigrants (CSAI), a refugee resettlement agency in Montreal. Through his organization, Khanafer gathered 100 young adults—a mix of longtime and newly resettled residents, including students and politicians—for an open dialogue where refugees could openly share their experiences of resettlement and the challenges of the process. When everyone around the room shared where they were from, he noticed that everyone was listing off provinces like Manitoba and Québec. When he asked one of the young refugees about why they decided to share which Canadian province they had been resettled in, the answer was simple: “We’re from here now.” Later that night, as the young adults spilled into the streets to return to their homes, a young man who had recently been resettled let out joyful cries of “CA-NA-DA! CA-NA-DA!” Canada was home now. These are the specific moments that remind us of the power of welcome. Of encounter. Of remembering that we are all children of God, called to walk together toward a more hospitable world. *Name has been changed to protect the individual’s privacy. 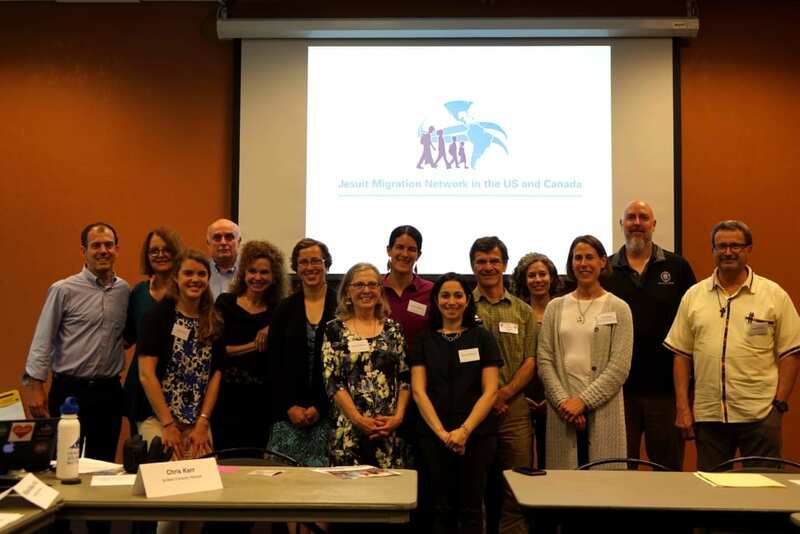 Individuals from the Jesuit network engaged in ministry, service, education, and research related to the situations of migrants and refugees in the U.S. and Canada gathered in Washington, D.C. last week for a sub-region meeting of the Jesuit Migration Network of Central and North America. Representing more than fifteen Jesuit and partner institutions, the group of staff and faculty met at Georgetown University Law School for a full day of sharing, networking, and brainstorming. The following day, a number of the participants met with U.S. Senate and House offices on Capitol Hill to share perspectives from the network on concerns including root causes of migration, the separation of children from parents as families seek asylum at the U.S.-Mexico border, and the situation of DACA recipients. Fr. Rafael Garcia, S.J. 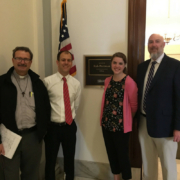 (Sacred Heart Parish – El Paso, TX), Christopher Kerr (Ignatian Solidarity Network), Amy Ketner (Saint Mary’s Student Parish – Ann Arbor, MI), and Mike Allison, Ph.D. (The University of Scranton – Scranton, PA) at U.S. 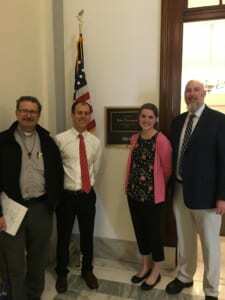 Senator Rob Portman (R-OH)’s office on Capitol Hill. The meeting, organized by the Jesuit Conference Office of Justice and Ecology and the Ignatian Solidarity Network, had three goals: to create space for reflection on the migration realities of the region and beyond; to better understand the ways the Jesuit network is responding to these realities; and to identify ways that U.S. and Canadian institutions can collaborate to support the response taking place in the U.S. and Canada as well as in Mexico and Central America. The gathering of U.S. and Canadian representatives was part of the broader efforts of the Jesuit Migration Network of Central America and North America (RJM-CANA), which promotes collaboration among Jesuit works in Central America, Mexico, the United States and Canada, committed to migrants, displaced people, refugees and their families. Organizations and institutions represented at the DC meeting included: Gesu Parish (Detroit, MI), Holy Trinity Parish (Washington, DC), Ignatian Solidarity Network, Jesuit Conference Office of Justice and Ecology Jesuit Refugee Service Canada, Jesuit Refugee Service USA, Jesuit Schools Network, Jesuit Social Research Institute, Kino Border Initiative Loyola University Chicago, Marquette University, Sacred Heart Parish (El Paso, TX), St. Mary’s Student Parish (Ann Arbor, MI), and The University of Scranton. U.S. and Canadian delegates participate in the yearly RJM-CANA meeting, which will occur again this October in El Salvador. Editor’s Note: This story was originally published on the Ignatian Solidarity Network site on May 22, 2018. 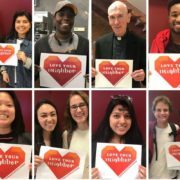 From February 11-18, 2018, the Jesuit and Catholic network in the United States captured the spirit of Valentine’s Day by showing love to their neighbor—regardless of immigration status. 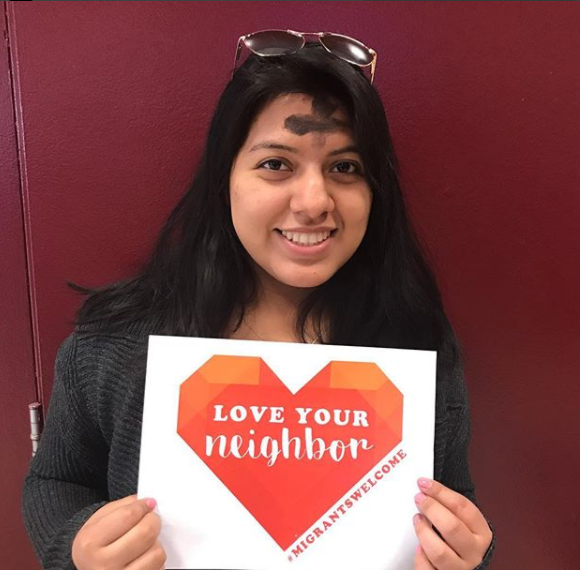 The Love Your Neighbor Campaign, facilitated by the Ignatian Solidarity Network, united more than 5,000 individuals in efforts to support, advocate with, and affirm the dignity of those who migrate. 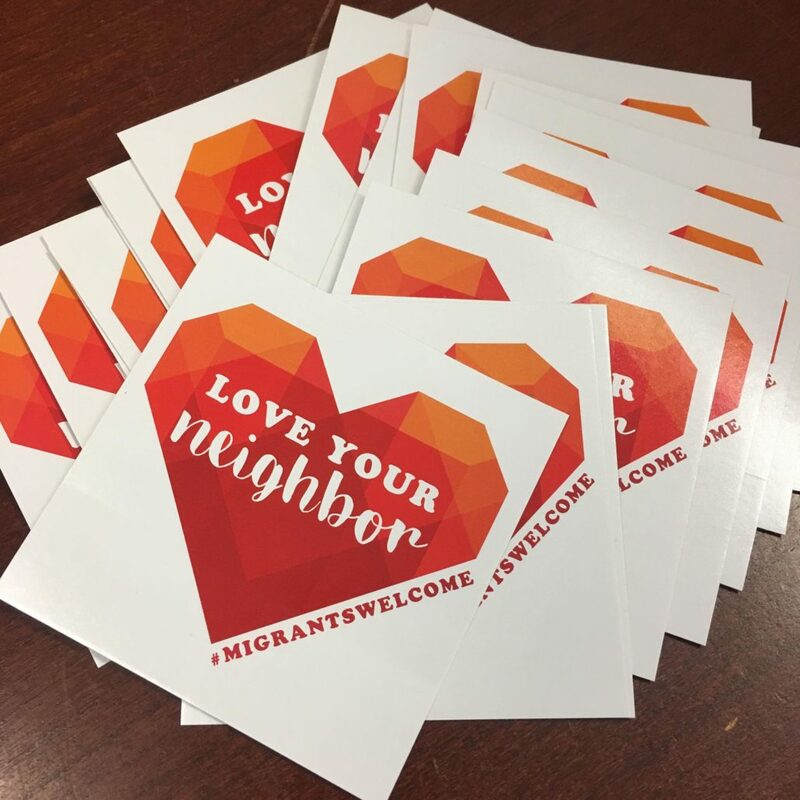 A component of the Campaign for Hospitality, a two-year initiative aimed at building a more just and welcoming culture toward those who migrate, Love Your Neighbor focused on action, advocacy, and support. Campaign actions included a fair-trade valentine “chocolategram” option in collaboration with Equal Exchange, a social media campaign utilizing #MigrantsWelcome, and a valentine-writing initiative to Congressional members throughout the U.S.
On Valentine’s Day volunteers from Holy Trinity Catholic Church, a Jesuit parish and ISN member institution in Washington, D.C., partnered with ISN to deliver nearly 200 valentines to the offices of U.S. senators and representatives who are graduates of Jesuit schools or serve a district or state in which a Jesuit institution is located. 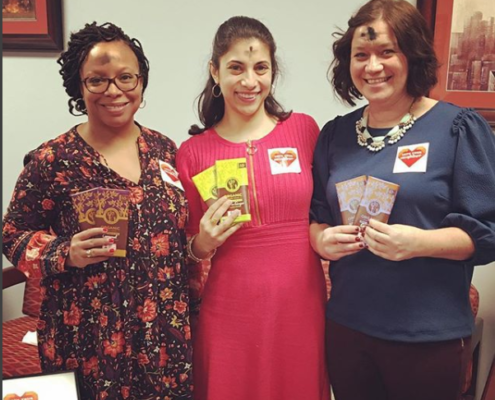 Holy Trinity Catholic Church staff and parishioners, including Christine Brown (second from right) delivered “Love Your Neighbor” Valentines to Congress. 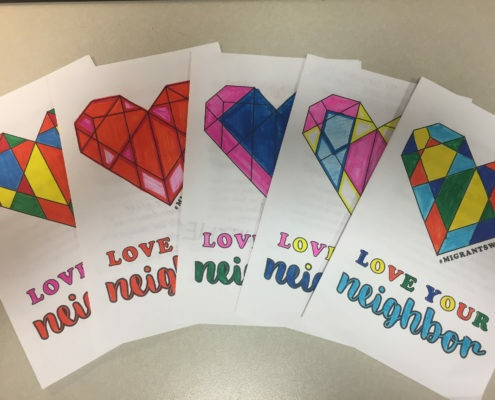 Hundreds of additional valentines were created and delivered via mail, fax, or in-person by students, faculty, staff, and parishioners at Jesuit and other Catholic high schools, colleges, universities, and parishes. 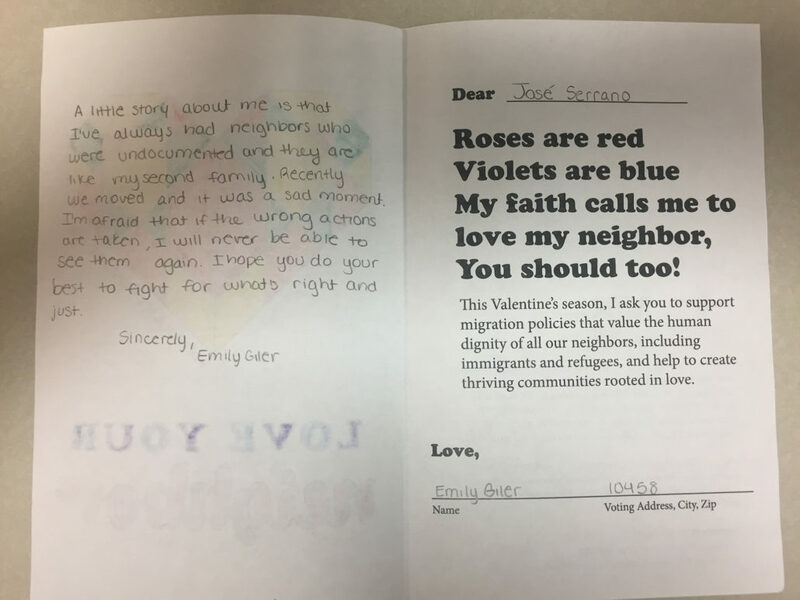 Valentines included many personal stories from individuals directly affected by immigration policy, or who support peers, neighbors, and community members who have immigrated. 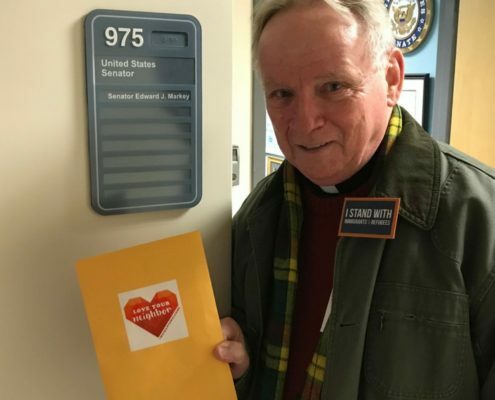 Nearly 200 members of Congress received a Valentine today, February 14, 2018, from the Ignatian Solidarity Network (ISN), inviting them to consider how they can “love their neighbor,” including those who are immigrants and refugees. The Valentines arrive to Capitol Hill as U.S. Senators debate immigration proposals, including a solution for Deferred Action for Childhood Arrivals (DACA) recipients, offered by President Trump as well Senate members of both parties. 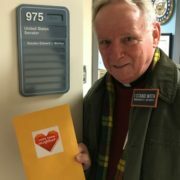 Volunteers from Holy Trinity Catholic Church, a Jesuit parish and ISN member institution in Washington, D.C., partnered with ISN to deliver the Valentines to the offices of U.S. senators and representatives who are graduates of Jesuit schools or serve a district or state in which a Jesuit institution is located. 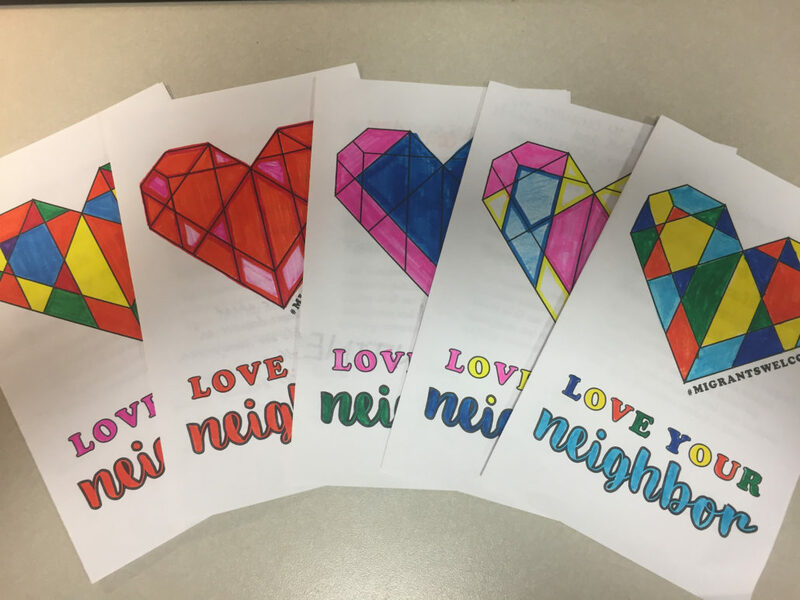 Holy Trinity Catholic Church staff and parishioners delivered “Love Your Neighbor” Valentines to Congress. The message in the Valentines: Roses are red, Violets are blue. Our faith teaches us to love our neighbor, you should too! 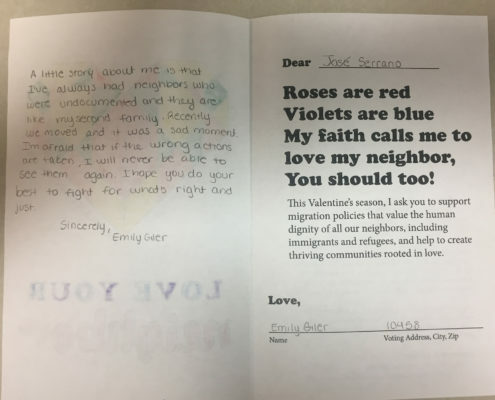 Included with each Valentine was a cover letter that called on members to work for compassionate immigration policies that support family unity, provide a pathway to citizenship for DACA recipients and other undocumented young people, and promote humane and just treatment of those who migrate. It also encouraged Congress to rethink policy proposals that unnecessarily militarize the border and increase the vulnerability of individuals fleeing their countries in search of safety. Fr. 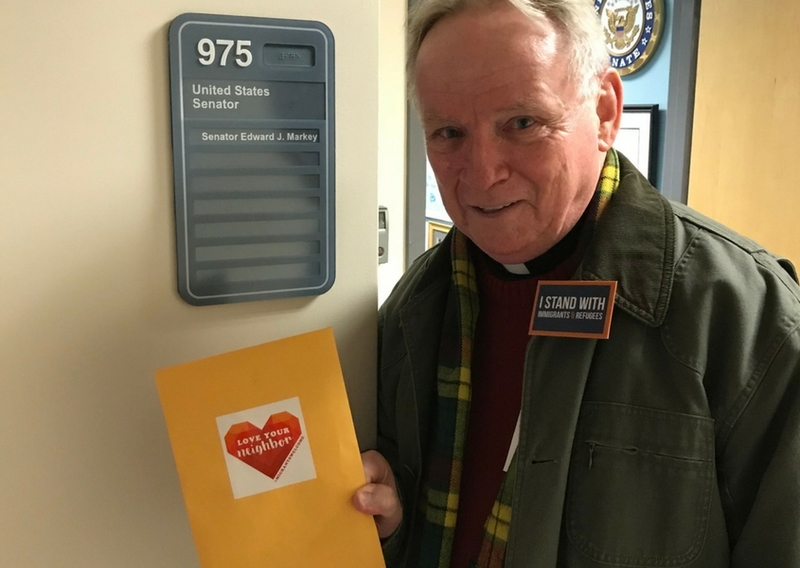 Donald McMillan, S.J., associate pastor at the Jesuit Parish of Saint Ignatius of Loyola in Chestnut Hill, MA, delivers a “Love Your Neighbor” Valentine to Massachusetts Senator Edward J. Markey. 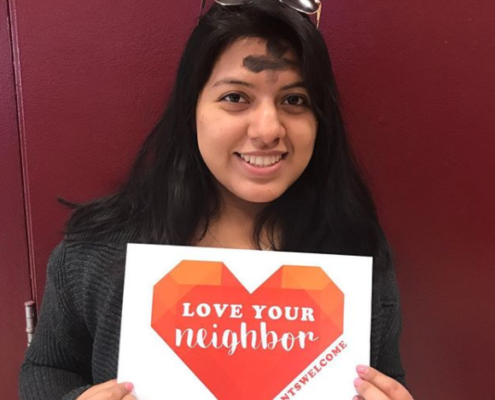 The effort on Capitol Hill is a part of ISN’s “Love Your Neighbor Campaign,” a Valentine’s Day-centered initiative designed to support those who migrate. 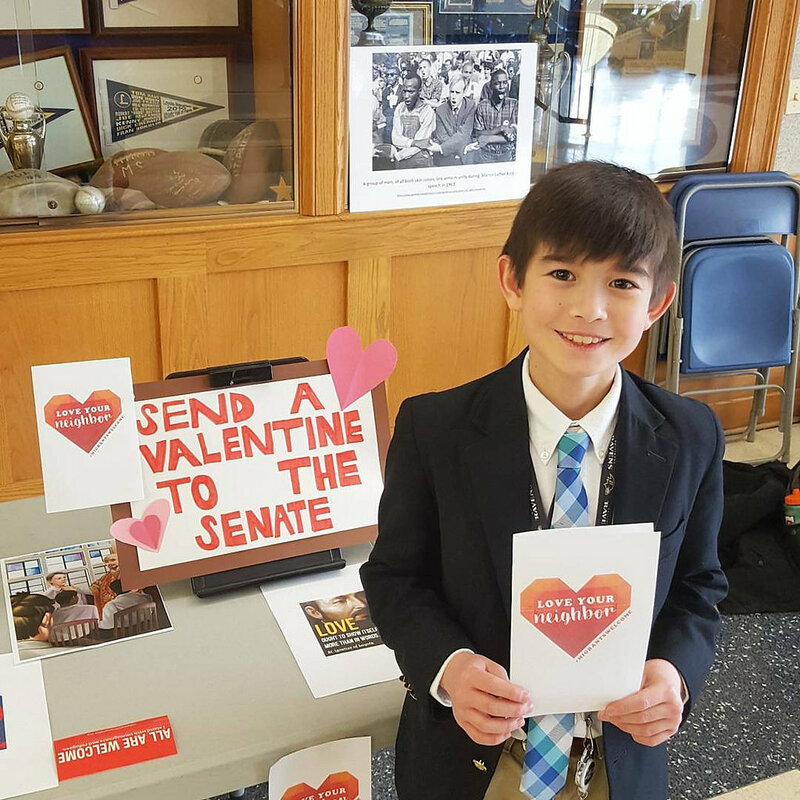 Institutions across the country, including Loyola Blakefield High School in Towson, MD; Cristo Rey New York High School in New York City; and The University of Scranton, in Scranton, PA, will create and deliver Valentines to district offices in their home states. 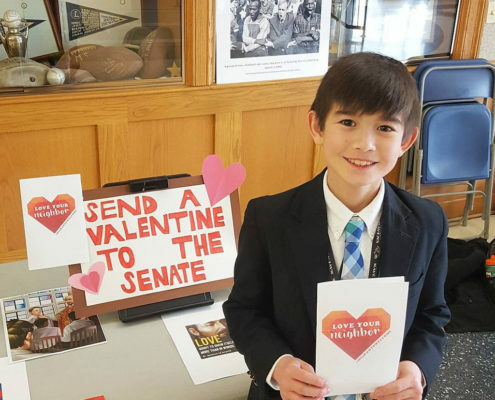 Share the love: send your own Valentine’s Day message to your elected officials. In response to the Tuesday, September 5 announcement that the Trump administration would end the Deferred Action for Childhood Arrivals (DACA) program, Jesuit colleges and universities across the U.S. will participate in a Dream Action Week from October 9-13, 2017. Focus will center around the Dream Act, a bipartisan bill introduced in the Senate. The bill outlines a three-step pathway to citizenship “for people who are either undocumented, have DACA or temporary protected status (TPS), and who graduate from U.S. high schools and attend college, enter the workforce, or enlist in a military program.” This is a critical legislative opportunity to protect people who strengthen U.S. communities. 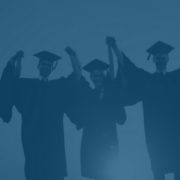 The action week, which was initiated at Loyola Marymount University, will invite administrative and student leaders at all Jesuit campuses to urge their campus communities to advocate for the Dream Act by calling their Senators, utilizing an action alert created in partnership with the Ignatian Solidarity Network. Each campus will plan additional educational, awareness, and advocacy events. A card designed to promote Dream Act advocacy efforts on Jesuit campuses during Dream Action Week. 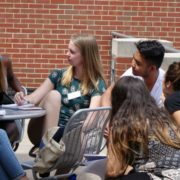 Last week, the student body presidents at all twenty-eight Jesuit colleges and universities in the United States released a letter in support of undocumented students and their allies, uniting as leaders on their campuses in response to the recent DACA decision and in anticipation of Dream Action Week. 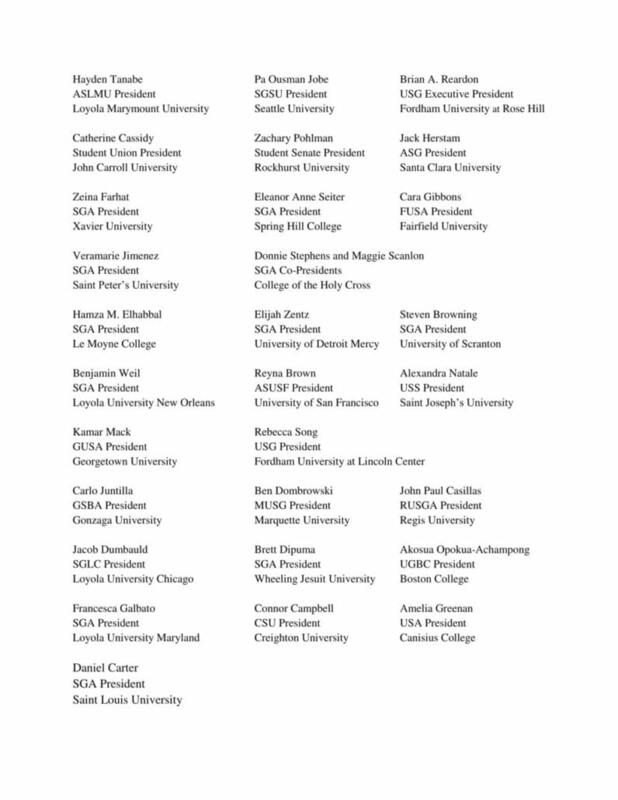 In response to the recent announcement of the removal of DACA (Deferred Action for Childhood Arrivals), the student body Presidents of the twenty-eight Jesuit colleges and universities in the United States publicly stand in solidarity with our undocumented students and their allies. We, as a collective unit, acknowledge that this is a human issue that will impact over 800,000 members of our nation. Immigrants have played a crucial part in the foundation of this nation and have dreams and aspirations like any other person; these dreams should be preserved and kept sacred just as any other. As colleges and universities rooted in the Jesuit traditions, our students are called to engage in the discourse and advocate for a more just and equitable world. In the face of injustice, we are challenged to practice a high level of discernment and allow our knowledge and experiences to inform our actions of being with and for others. It is important to emphasize that our unifying mission underlines the commitment to all people, regardless of national origin and documentation status. Any action and policy that seeks to divide and tear us apart should never be accepted and thereby calls for our total resistance to such. Work on behalf of our constituents to start the chain of calling our representatives. 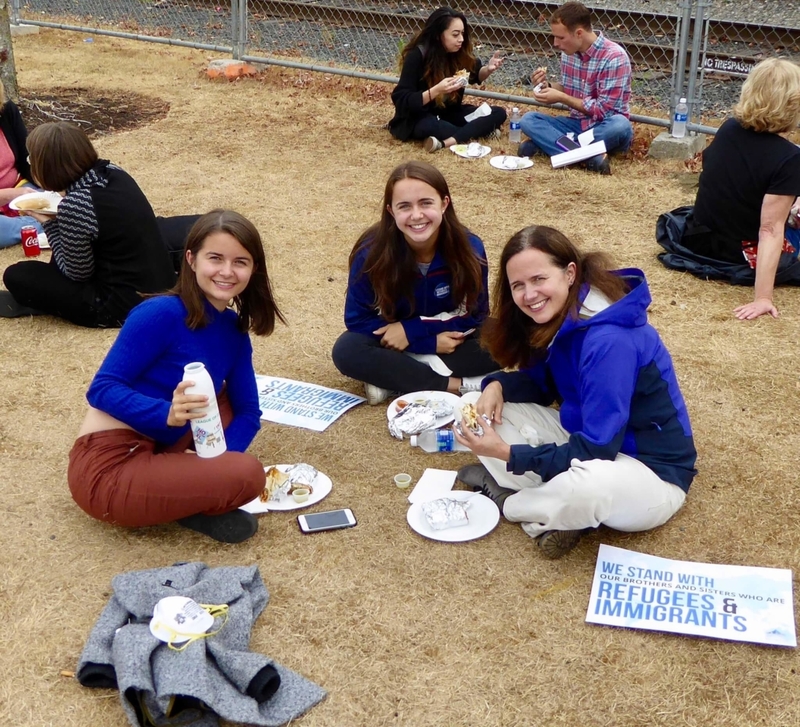 Orchestrate educational efforts for students to learn more about the topics of immigration and DACA and how it relates to our Jesuit mission. Strive to engage our students in dialogue and/or demonstrations that denounce the removal of this program. Promote action off-campus to stand with the rest of the country in creating a greater understanding of the need for DACA and garnering more support of Congressional legislation. Remind students of the appropriate resources on our respective campuses that support the spiritual, psychological, and emotional well-being of our students in order to uphold the value of cura personalis (care for the whole person). With this statement, we encourage all students to treat this recent announcement of the removal of the DACA program as a call to action to stand with and contest this decision alongside those at the margins. We would like to highlight the importance of becoming educated on the matters at hand, participating in public protest, and communicating with your respective legislators to enact change. The understanding of our privilege must be utilized to realize our roles as higher education institutions in catalyzing social change in our contemporary world. We urge our peers across the country to stand together and for our undocumented students. Editor’s Note: This piece was originally published as part of the Ignatian Solidarity Network Voices for Justice blog series. The Catholic Legal Immigration Network, Inc. and Church World Service delivered a letter to the Acting Secretary of the Department of Homeland Security Elaine Duke on Monday, September 18, urging her to extend Temporary Protected Status, or TPS, for more than 430,000 people. The letter was signed by nearly 700 faith leaders and faith-based organizations from across the country, including the Ignatian Solidarity Network. Temporary Protected Status (TPS) provides protection from deportation and work authorization to people from countries that have been deemed too dangerous to return home. Similar to the Deferred Action Childhood Arrivals (DACA), which was recently terminated, the Trump Administration seeks to strip the legal status of immigrants who have lived and worked in the country for years. TPS holders are parents to nearly 275,000 U.S. citizen children. The vast majority of TPS holders are essential immigrant workers who have long contributed to the United States, filling crucial industries. They are childcare workers, small business owners, gardeners, cooks, builders, store clerks, and janitors. Recent decisions to terminate DACA and TPS for Sudan as well as the looming threat to terminate TPS for Haiti mark a sharp turn away from core American values. With deadlines looming for TPS decisions that would affect more than 430,000 people, faith leaders and faith-based organizations are urging the White House to keep these essential workers protected under TPS until Congress can pass a lasting legislative solution. If the president and Acting Secretary Elaine Duke were to terminate their legal status, these immigrants would be forced to leave the country regardless of their family situations and long-standing ties to the United States. TPS holders would be forced to return to countries that are recovering from catastrophic natural disasters, disease, and rampant violence. Editor’s Note: This piece was originally published as part of the Ignatian Solidarity Network News From the Network series. Editor’s Note: The listing is not exhaustive and will be updated with additional statements and actions as they are made available. To request the addition of a statement, event, or action, please e-mail Kelly Swan at kswan@ignatiansolidarity.net. On Tuesday, September 5, Attorney General Jeff Sessions announced that the Trump administration would end the DACA program—undermining the dignity of 800,000 undocumented young people. Jesuit institutions throughout the country have established themselves as institutions of learning accessible to a diverse range of students, including those who are undocumented. 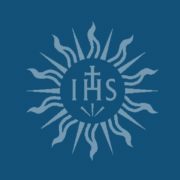 The Jesuit network—including the Jesuit Conference, Association of Jesuit College and Universities, the Ignatian Solidarity Network, and various schools and student groups—has quickly mobilized to offer support and begin to take action as advocates for the dignity of those affected by this decision on DACA. 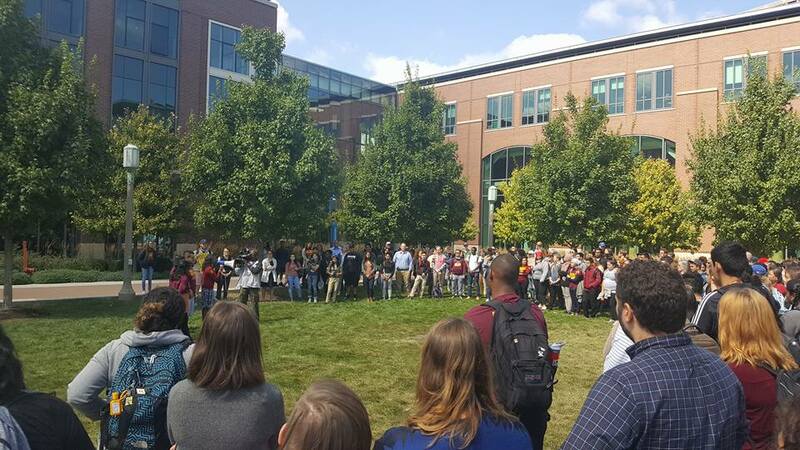 Students, faculty, and staff at various Jesuit institutions immediately mobilized both on campus and in their communities, calling attention to the personal impact of this decision. Loyola University Chicago undocumented students and allies at a September 5 rally. Students gather for “Prayer Vigil in Solidarity with Young Immigrants” on the campus of the College of the Holy Cross on the evening of September 5. In the background, Campion House, home of the Office of College Chaplains, can be seen, where candles will remain lit in the windows as a sign of welcome and solidarity with those impacted by DACA. 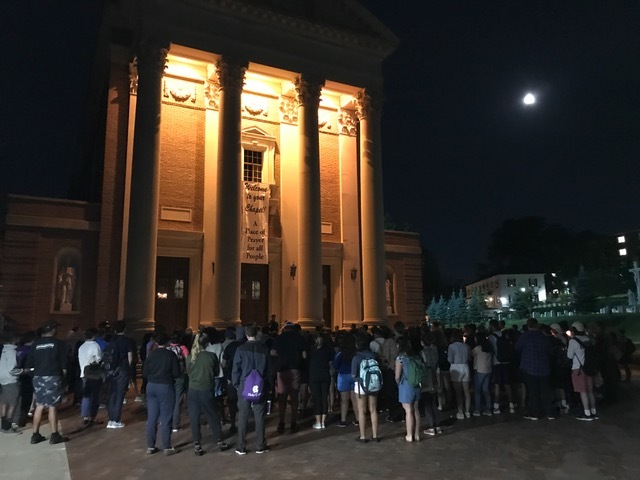 On the evening of September 5, approximately 300 faculty, staff, and students gathered in prayer for the undocumented, particularly DACA recipients. 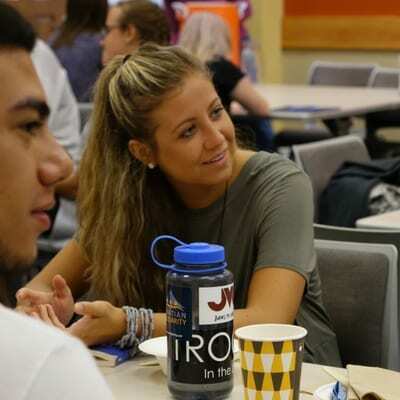 For four days in late July, thirty-eight Jesuit college and university students gathered, brought together by a shared capacity for compassion, for the Ignatian Justice Summit. 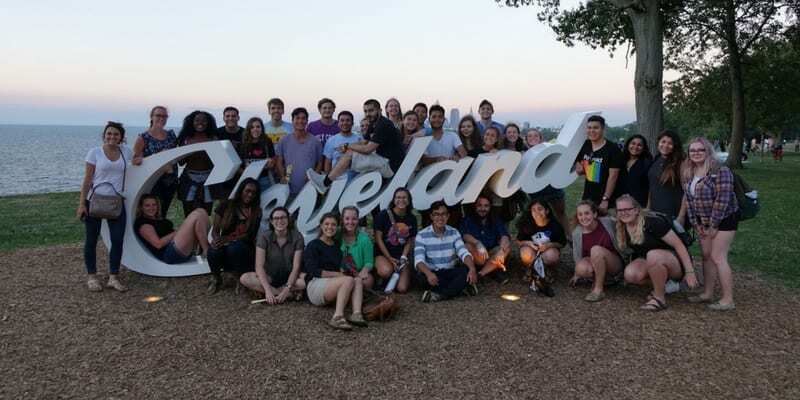 Students from fourteen Jesuit colleges and universities gathered near Cleveland, OH in late July for ISN’s Ignatian Justice Summit. 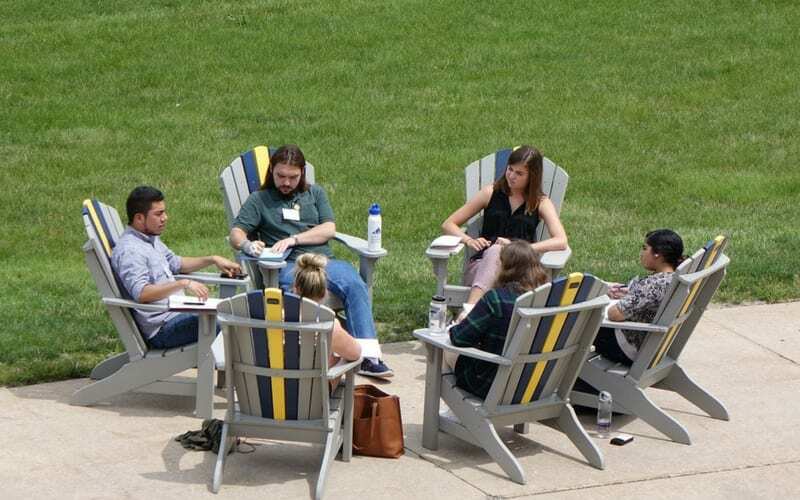 The Summit, facilitated by the Ignatian Solidarity Network and held on the campus of John Carroll University in University Heights, OH, drew participants from fourteen Jesuit schools—Boston College, Canisius College, College of the Holy Cross, Creighton University, Georgetown University, John Carroll University, Loyola Marymount University, Loyola University Chicago, Loyola University Maryland, Rockhurst University, Saint Louis University, Saint Peter’s University, Saint Joseph’s University, and Xavier University—throughout the U.S. to connect, educate, and network for immigration justice. José Cabrera (left) speaks with a fellow Ignatian Justice Summit participant. Partners from the Jesuit network brought specific expertise and experience on immigration issues. 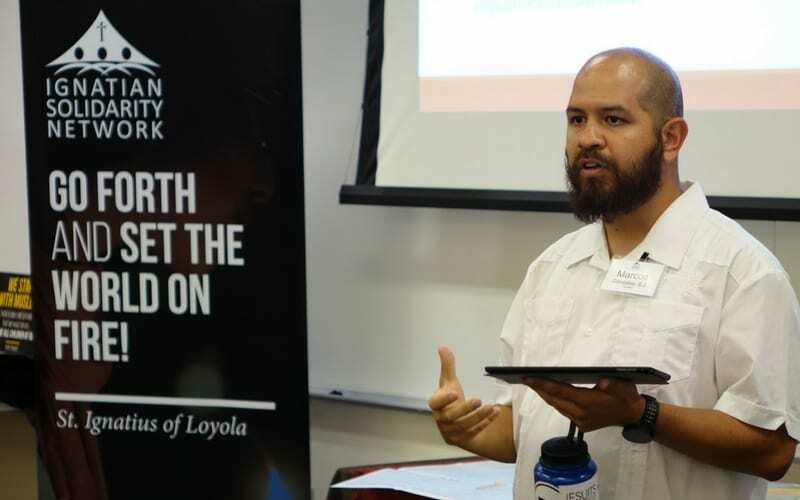 Marcos Gonzales, S.J., case manager and local organizing committee member at Homeboy Industries, grounded the Summit in the Ignatian tradition. Gonzalez drew students into a deeper understanding of immigration justice, Ignatian spirituality, and exploration of their own personal faith and history in their own work for justice. Marcos Gonzales, SJ, guides participants through reflection and discussion on seeking justice through an Ignatian lens. 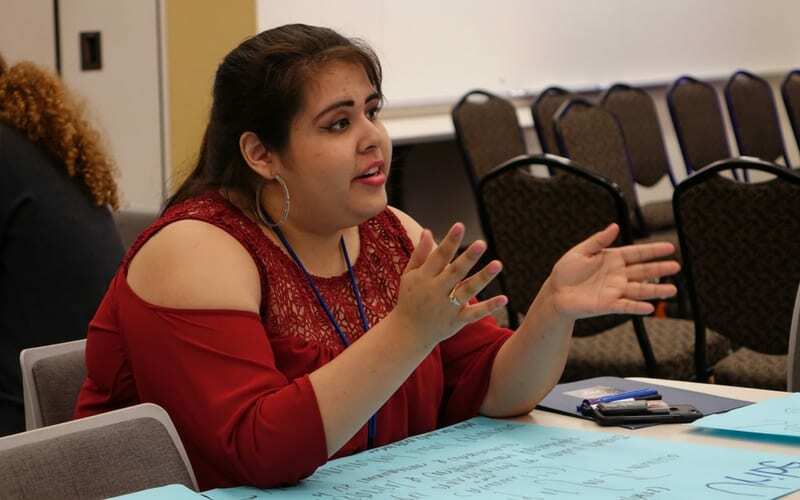 Miriam Uribe, a 2017 University of San Francisco graduate who is both undocumented and an advocate for the undocumented community, joined participants at the Summit as a powerful voice in the week’s conversations about migration. Miriam Uribe at the Ignatian Justice Summit. As part of a panel discussion on Jesuit network innovation, Uribe outlined her success in planning and implementing a campus “UndocuWeek” at the University of San Francisco. 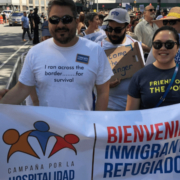 The event celebrated and highlighted the struggles of the undocumented community, serving as a call to action for both individuals and institutions to uphold Jesuit values and stand up to injustices faced by undocumented people. Uribe was joined on the panel by Flavio Bravo, a Loyola University Chicago graduate who, as a student, worked to pass the Magis Scholarship fund for undocumented students. Natalie Terry also shared the work of St. Agnes Parish in San Francisco, a Jesuit sanctuary parish sponsoring a refugee family in their community. 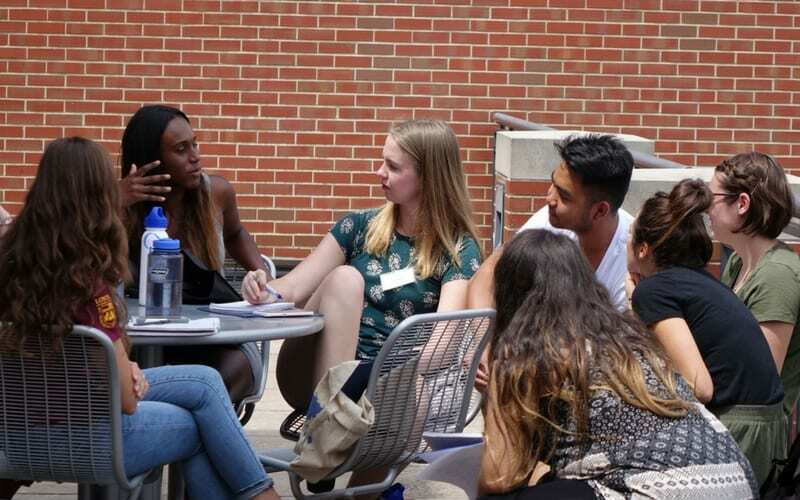 Students participate in a social justice incubator session, sharing innovative responses to immigration and other social justice issues on their campuses to promote network-wide collaboration and spark new ideas. Students discuss immigration issues on their campuses. Sabrina Blakely discusses her delegation’s action plan with Summit participants from other schools. As the Summit came to a close, energy was high as students from each school shared action plans with the group. Many students had already reached out to peers, administrators, and faculty members at their schools to clarify policies, pitch ideas, and learn more about current realities for students at their schools who are immigrants. Ideas centered around ways to increase dialogue and storytelling with campus communities, events promoting awareness and action on immigration issues, and scholarship programs for undocumented students, amongst others. Share the love – Spread the word!